Angina comes from the Latin word for pain but when used in modern medical terms is almost always used to describe the pain that comes from the heart in people with coronary artery disease. More correctly it should be called angina pectoris. The purpose of the heart is to pump blood to the various tissues of the body thereby supplying them with the oxygen and the sugar which is used as the fuel supply for the cells of various tissues thereby enabling them to stay alive and function normally. So for instance the muscles of the legs have a rich blood supply and whilst we are at rest they have a relatively low background rate of using these nutrients but when we exercise, for instance by running up a flight of stairs, the muscles need a lot more of the oxygen and sugar to develop the energy so that they can repeatedly contract and relax to propel the legs and carry the body rapidly up the flight of stairs. To increase this blood supply to the legs the heart beats harder and faster and, of course, in doing so the muscle of the heart also requires an increased supply of oxygen and sugar to enable to it carry out this increased workload. The blood supply to the heart is largely through blood vessels that run over the surface of the heart and down into the muscle of the heart and these originate just above the aortic valve off the aorta which is the big blood vessel coming out of the top of the heart. Most people have a right coronary artery which comes off on the right side of the aorta and runs round down underneath the heart to supply the bottom surface of the heart and a left coronary artery coming out on the left side of the aorta which usually splits up into two branches, one running down over the front of the main pumping chamber of the heart (this is called the left anterior descending artery) and one running down the back of the heart towards the inferior surface (this is called the circumflex artery). These three main arteries have further smaller branches coming off them and these in turn have further smaller branches which penetrate into the muscle of the heart to deliver the blood supply to the muscle tissue. In normal circumstances, even at very increased work rates, the flow of blood down these arteries is sufficient to maintain the muscle of the heart with adequate oxygen and sugar however fast it is being used up, and indeed with increased exercise these arteries tend to dilate (that is they get wider) thereby allowing faster flow of blood down the arteries to the muscle. 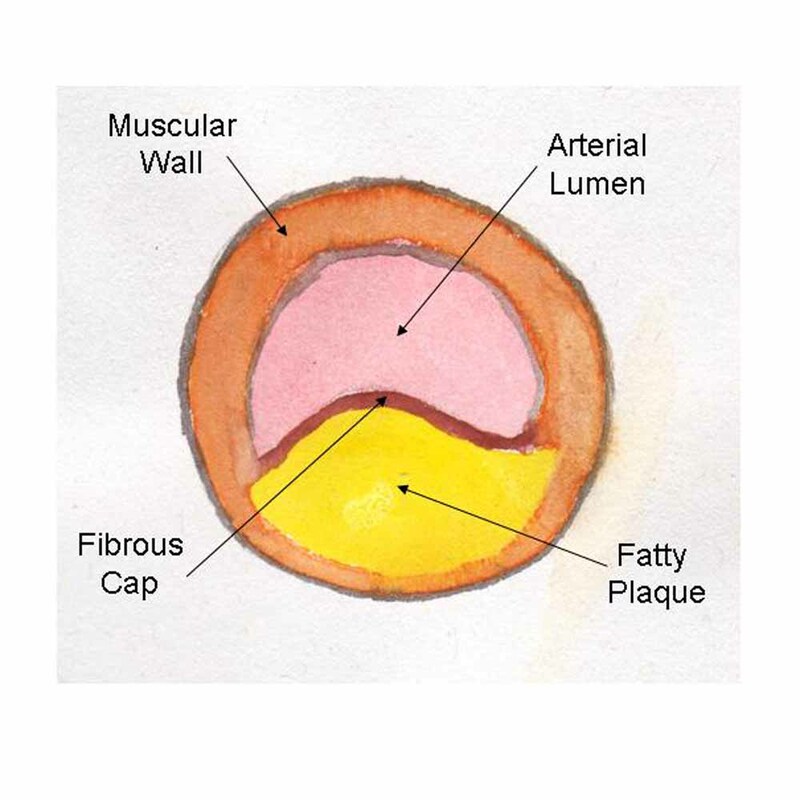 In coronary artery disease fat accumulates in the wall of the artery and as the amount builds up the fatty deposit starts to expand into the lumen of the artery reducing the cross-sectional area and slowing the flow of blood. The greater the amount of fat deposited the greater the reduction in the blood flow. 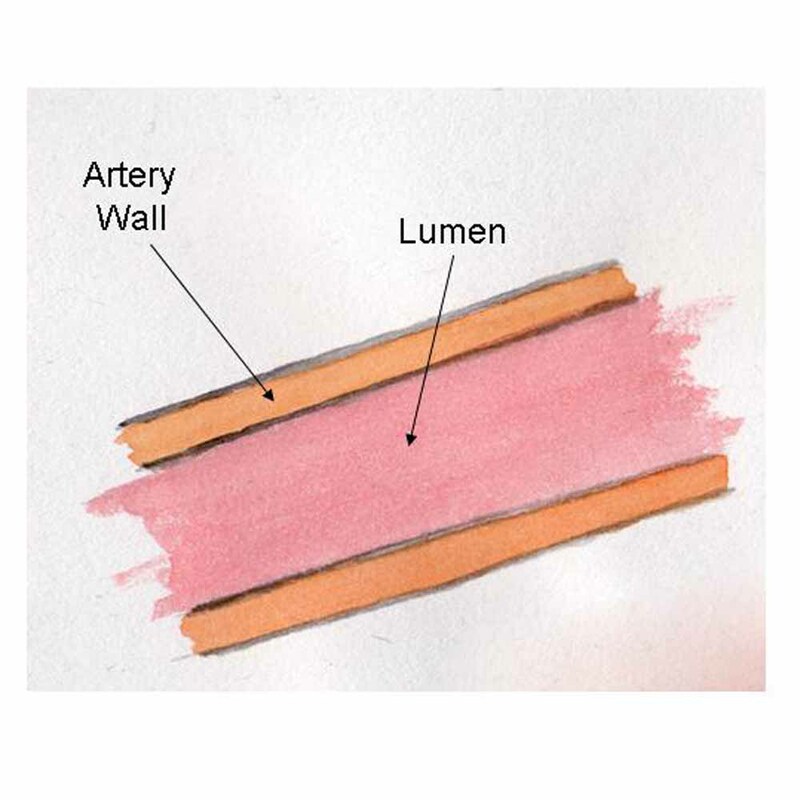 In a normal coronary artery most of the wall is made up of muscle. The inner lining of the vessel is called the endothelium and between this and the muscle is the intima. White cells called monocytes within the intima ingest LDL cholesterol which causes them to change into foamy cells and die. Over time, as this process is repeated, the fat builds up causing a fatty swelling called a plaque. The reaction of the endothelium covering the plaque causes a layer of fibrous tissue to be laid down over the plaque. 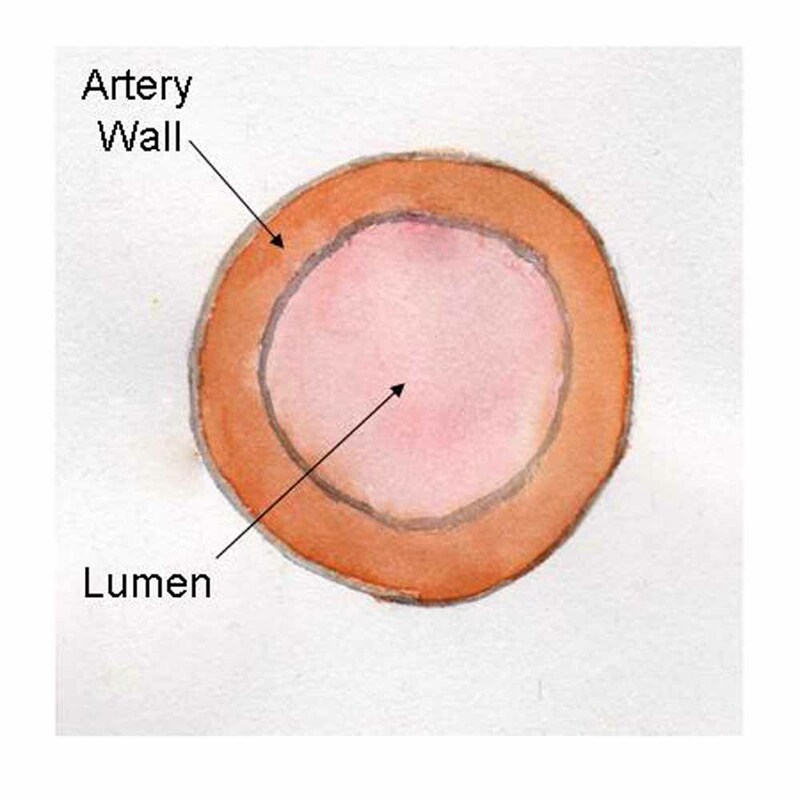 As the plaque becomes bigger it encroaches more and more on the lumen of the artery causing a greater degree of obstruction to blood flow down the artery. This may cause the onset of, and subsequent worsening of, symptoms of angina. Interestingly this often is not a slow and gradually progressive process. Plaques may stay much the same size for long periods of time and conversely there may be sudden changes in their size causing a sudden deterioration in a patient's symptoms. 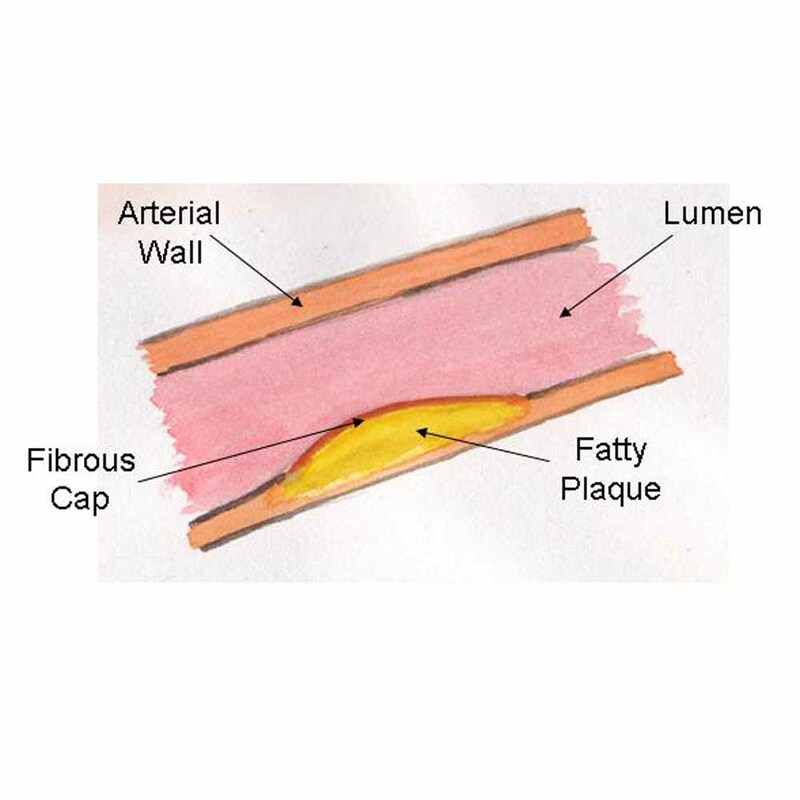 This may be because the fat causes inflammation in the artery wall making the plaque unstable. Statins are helpful in a number of different ways. They reduce the amount of LDL in the blood stream making plaque formation less likely to occur and slowing any accumulation of fat over time. They also seem to reduce the inflammatory process making the plaque more stable and the fibrous cap less likely to fissure (the mechanism by which heart attacks occur). The sensation of angina occurs when the heart muscle starts to use up its oxygen supply quicker than it can be replenished. As stated above, this just about never happens in a normal heart, but if there is narrowing of the coronary arteries then the flow down them may not be sufficient at higher work rates to deliver enough of the oxygen and sugar to meet the requirements of the muscle. Furthermore, if the narrowed segments of the arteries are hardened by deposition of fat which can harden and become calcified then this means that the arteries cannot dilate as they would normally do to allow improved flow during times of heavy exercise and this makes the development of angina more likely to occur. As can be seen from the above, it is much more likely that people will suffer angina when their hearts are having to work harder than they normally would at rest. Usually this occurs when people start to exercise and often people with angina will recognise a certain level of exercise which will always provoke the onset of their symptoms. However, anything which makes the heart work harder and faster can provoke angina and many people will also recognise that they get angina if they become angry or emotional as this causes the body to release adrenalin which makes the heart beat harder and faster. The threshold with which angina may come on may also be lowered in certain circumstances. This is particularly so if the weather is colder or windier when people will find that they have a lower threshold of exercise before the symptoms start and many people will also notice that if they have had a heavy meal before they exercise then the symptoms will come on earlier. In the latter circumstance this is because the heart is having to pump more blood to the stomach and guts to help with the digestion and absorption of food as well as pumping blood to the exercising muscle and this causes it to work harder. Most, but not all, patients who have angina will experience a sensation of tightness or heaviness in the centre of their chest behind their sternum (breastbone). Often this will radiate outwards across the chest or around the chest and be described as a band-like sensation. It may also spread up into the throat and lower jaw where it may feel like a tightness or a burning. Many patients may also experience radiation of the pain up into the left shoulder and down the arm (more commonly along the inner aspect of the arm down towards the elbow). Not all patients however have classical symptoms and some may feel a burning in the pit of their stomach and others an uncomfortable sensation between their shoulder blades. Others will feel breathless when they exert themselves although this will more often be a feeling of a tight discomfort rather than a panting sensation. Usually, as described above, these episodes of angina can be recognised as being precipitated by a stimulus - most often one of increased physical work but sometimes due to anger or emotion. If patients with angina start to get symptoms at rest this is a worrying sign suggesting that flow of blood to an area of the muscle of the heart has become critically reduced such that even at rest the supply of nutrients to the muscle of the heart is borderline to the requirements of the muscle of the heart. In these circumstances patients require urgent investigation as it is suggestive that they are at a significantly high risk of having a heart attack. Any patient who recognises that their angina frequency is increasing, the severity and length of attacks is getting worse or they are starting to get pain at rest when they werent beforehand should urgently contact their doctor as these features suggest that they should undergo a significant revision in their medications and probably urgent hospital investigations of their symptoms. 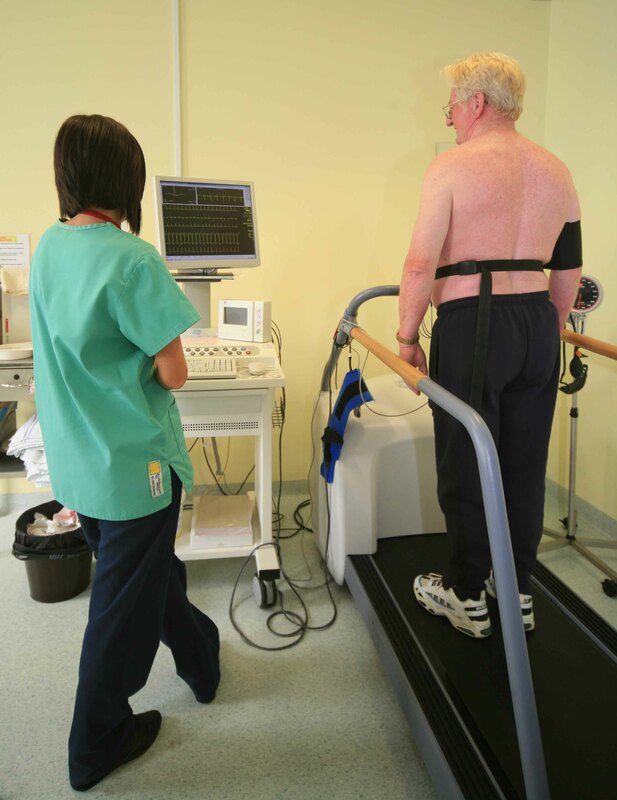 If patients cannot undertake a exercise test an alternative way of investigating the heart is a myoview scan. This relies on stressing the heart with a chemical to make it beat faster and we can use a variety of different pharmaceutical agents including Dobutamine, Adenosine or Dipyridamole and when the heart is working hard stimulated by these chemicals a radioactive substance is injected into the vein. This substance is taken up into actively working muscle but only if it has a good blood supply. Therefore, where there is a good supply to the muscle of the heart the isotope will be taken up quickly and completely, and where there is a significant narrowing or blockage of an artery to the muscle of the heart it will not. On the resulting scan which is conducted by lying the patient under a scanner which detects radioactivity one may see areas which shine brightly where the radioisotope has been taken up and other areas which either dont take up the isotope at all or are much less bright. This scan is usually followed up by a resting scan so that one can tell the difference between areas which are scars on the heart (where the isotope doesnt get taken up either on the stress or rest scan) and areas which are due to poor supply of blood to muscle which is still alive (where there may be a hole on the stress scan which completely reverses and looks normal on the rest scan). Ultimately the diagnosis as to whether or not there is underlying coronary artery disease can usually only be made by an invasive investigation called cardiac catheterisation and coronary angiography. This relies on introducing radio-opaque dye down the coronary arteries under an x-ray machine such that the arteries themselves can be imaged to see whether or not there are any narrowings or blockages within the arteries restricting blood flow to the muscle of the heart. 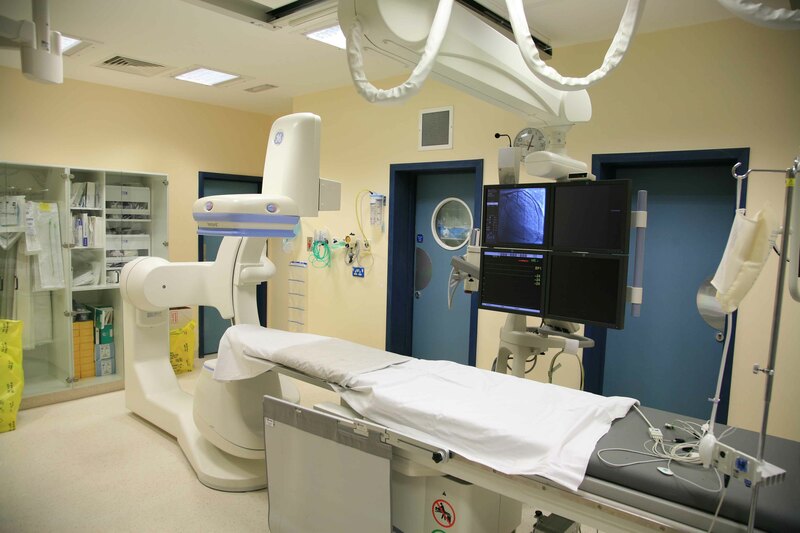 The procedure is carried out in a specialised radiology room called a cardiac catheter laboratory under sterile conditions. Usually the tubes that are used to carry out the investigation (catheters) are introduced into the femoral artery at the top of the patients leg in the groin under local anaesthetic. They are then run backwards up the large blood vessel (the aorta) to the area where it comes out of the heart as this is where the coronary arteries arise. The catheters are then manoeuvered under x-ray control so that their tips lie just in the origins of the arteries. The radio-opaque 'dye' (contrast) is then introduced into the right and then left coronary arteries and images are taken in several different projections to give a full picture of the coronary arteries. This investigation may be necessary to determine whether or not somebody has got coronary artery disease and therefore deciding which treatments may or may not be appropriate in terms of symptom control and the use of any medications to prevent disease progression. It may also be used in patients in whom coronary artery disease has already been diagnosed to determine whether intervention on their coronary arteries such as angioplasty and stenting or coronary artery bypass grafts is necessary as well as the medications to control symptoms and disease progression. Since the cause of angina is the inbalance between oxygen delivery to the heart muscle and oxygen usage by the muscle the treatments not surprisingly are tailored to improve the balance between these two factors. Medications that reduce oxygen demand such as Beta-blockers or calcium channel antagonists are cornerstones of symptom management and are also doubly useful as Beta-blockers are protective against heart attack as well. Nitrates are used to try to improve blood flow to the muscle of the heart thereby improving oxygen delivery. This is achieved by opening up the blood supply around the diseased arteries (collateral blood vessels) rather than the diseased arteries themselves. Calcium channel blockers can help reduce the oxygen demand by making the heart beat less quickly and strongly in a similar fashion to the Beta-blockers and may also help with the collateral blood supply like the nitrates. Potassium channel activators can also be useful and act in a similar way to nitrates. Disease progression is best controlled by modifying risk factors such as smoking, hypertension, cholesterol and diabetes. Increased physical activity and weight loss are also likely to be beneficial. Statins and Aspirin are undoubtably beneficial in reducing disease progression quite independantly of any of the above interventions. Reducing the risk of a future heart attack is clearly very important and can best be achieved by a combination of interventions. An improved lifestyle with more exercise and a healthy diet is of proven benefit as is giving up smoking in smokers. Statins, Aspirin and Beta-blockers have all been shown to reduce future events and in those with the highest risk, physical interventions such as angioplasty or by-pass grafting may also be useful.